Week 15. Week. Fif. Teen. Sorry this is late. I mentioned on Wednesday that work has been crazy and that is true. I've managed to get my training in each day. It's essential to my sanity at this point. So things are moving along. I'm noticing an increase in distances. Bring it. My Monday swim felt really good. It had been awhile since I was in the pool and this just felt good. I realized after this swim that I needed the forearm paddles that my swim coach recommended. So I ordered them. And some replacement cables for my other paddles. And about 15 pairs of black tri shorts that I need to try on and widdle down and choose. Tuesday. OK. I mentioned that we got our power meters on the bikes. So part of that requires another time trial so our coach can set our power thresholds. I did the 3 minute time trial last week and this week it was time for the 20 minute job. It was hard. And I'm throwing out a spoiler and will fill in more detail next week: I HAD TO DO IT AGAIN IN WEEK 16 - I HAD TO REDO THE 20 MINUTE TIME TRIAL - THE TIME TRIAL WHERE YOU GO ALL OUT ON THE BIKE FOR 20 MINUTES. That's right. Only an ALL CAPS assault on your eyes can convey how devastating this was. More info next week because I am still too fragile to discuss. After my time trial, I did a 50 minute endurance run outside. Outside!!!! It was a perfect, amazing run. Just wonderful. I've been cooped up on the gruther munking treadmill for way too long. So to be outside and to have everything feel so great was a nice little shot of happiness in the arm. Thursday was a long run - 75 minutes but all at endurance pace. It was approximately -15 degrees that day. As much as I wanted to avoid the treadmill, I wanted to avoid lung issues more. So I did it on the treadmill. Here is proof. all treadmill and no outside makes shanna a dull girl. The rest of the workouts were fine - nothing really of note. I just got them done, logged them and went along my merry way. 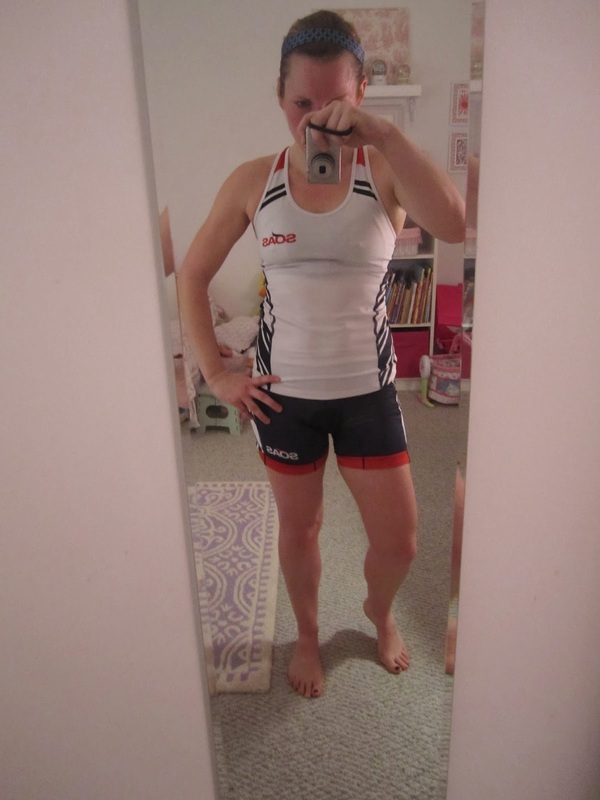 And to close it out, here is a picture of me in my tri kit as of this past week. I thought it might be fun to see how I change (or don't change as the case may be) over these next few months of training. I will tell you: I have never been hungrier in my life and I eat quite a lot. Those who know me well just clutched their pearls and grabbed their smelling salts because that is really saying something and we are only in March. I am literally eating to train. OK and because I really love food. But I'm not restricting food and I'm also not getting on the scale. My clothes still fit, but I feel like I've probably put on a few pounds, which could be due to the whole "winter insulating my loins" phenomenon that my friend Ava mentioned or maybe it's just because I am eating like a wild animal who is also rabid and ravenous. In any event: here I am 15 weeks in. I feel like I look exactly like I always do with may be a bit more definition in my legs and arms. I'll post these pics in the same tri kit every month going forward. The headband, however, will likely get changed up. Happy Weekend! Set those clocks forward and get an extra hour of sunlight. I'm going full on Pollyanna on the internet right now: Spring is almost here!!!!!!!! 1. as I can only workout vicariously through your posts for the next 5 weeks I will tolerate tardiness in the posting. please improve that in the future.